It's that time again, as I'm putting together a very special Best of Italy wine class in my hometown of Chicago. I've selected ten very special wines that will give everyone attending a great overview of today's Italian wine landscape. We will taste various styles of wine, from Franciacorta, the great sparkling wine of Lombardia to Barolo, Brunello and Amarone. 2007 Speri Amarone della Valpolicella Classico "Vigneto Sant'Urbano"
The class will be held at Perman Wine Selections, 802 W. Washington Blvd., Chicago at 6:30 on Fiday, Oct. 21. Craig Perman operates this beautiful small wine retail shop in the West Loop, providing an excellent selection of artisan estate wines from around the world. Note that many of the wines in this special class will be bottles that I have acquired over the past year from several trips to Italy. Some of the wines will be from the shelves of Perman Wine Selections as well. Seating is quite limited and will be offered on a first-come, first-serve basis. There will also be some food served with the wines. This is a very special event that will cover the amazing Italian wine industry! The price is $55 per person. If you would like to enroll in this class, please email me at thomas2022@comcast.net for information on how to sign up. This will fill early, so don't delay! Impressive new releases from Chile that I've tasted recently include two wines from the Single Vineyard line from Anakena Winery. Located in the Rapel Valley, the winery has vineyards in several areas of the country, including Cachapoal, Leyda and Colchagua Valleys. There are several lines of Anakena wines from the basic Varietal wines to the premium Ona wines, small lot bottlings that include Pinot Noir, Syrah and blends including Riesling/Viognier/Chardonnay and Cabernet Sauvignon/Carmenere/Syrah. Located west of Santiago, Casablanca Valley is a cool climate zone not far from the Pacific Ocean; first planted in the 1980s, it is an ideal spot for varieties such as Pinot Noir, Chardonnay, Riesling and Sauvignon Blanc. Pleasing varietal aromas of spearmint, gooseberry and freshly cut hay. 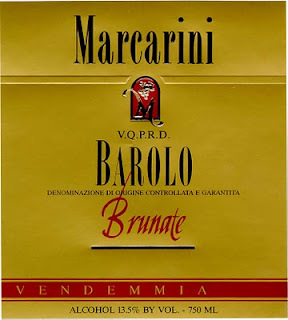 Medium-bodied, this has an elegant entry on the palate along with good acidity and subtle herbal notes in the finish. This is a nicely made cool-climate Sauvignon Blanc. Enjoy over the next year with shellfish or lighter chicken dishes. The Peumo appellation is located in the western reaches of the Cachapoal Valley in western central Chile. Bright purple with inviting aromas of black raspberry, mocha, nutmeg and vanilla. Medium-bodied with very good concentration. Fresh and quite tasty, this is a delicious wine with well-defined varietal character, good acidity, round tannins and a distinct spiciness in the finish with notes of black pepper and cumin. Very appealing now and over the next 1-2 years. Very good value. The Morellino di Scansano Consorzio will be presenting its first ever American tour with events in Chicago and New York on October 17 and 19. In each city, there will be a seminar about these wines (I will be moderating this in Chicago on the 17th) followed by a walk-around tasting. Morelllino di Scansano is a Tuscan red that is somewhat of a secret to many Italian wine lovers. The wine is produced primarily from the Sangiovese grape, which is named Morellino (or "little cherry") in this area in southwestern Tuscany. The vineyards are close to the sea, meaning the local climate and soils are quite different from the inland wine zones of the region, such as Montalcino or Chianti. It is interesting to taste the wines of Scansano, not only for their excellent quality, but also to understand a different style of Sangiovese in Tuscany. This promises to be quite an educational experience! The New York event will be held on Wednesday, October 19 at the Metropolitan Pavillion at 125 W. 18th Street. This will be one of the seminars that day as part of the VinItaly US tour, which will also have a stop in Washington, D.C. on October 19. Other seminars in New York that day will include one on social media as well as a study of Soave and Etna, two wine zones with volcanic soils (this promises to be quite fascinating!). A grand tasting will follow the seminars. (Note: there will be only one seminar - on Soave - in Washington, D.C., followed by a grand tasting. I wanted to let my readers know about one of the finest Italian wine events of the year. It's the Simply Italian tour and the official invitation is just out. The event this year will focus on wines from several regions of Italy, including Veneto, Piedmont and Tuscany. There will also be a special focus on the great sparkling wines of Franciacorta (I'll be moderating the seminar in Chicago) as well as the wines from the Grandi Marchi producers, a group of some of Italy's finest wine estates, including Antinori, Donnafugata, Gaja, Mastroberardino and Pio Cesare, to name only a few. The tour will begin in Chicago on Monday, October 24 and then move to San Francisco on October 26 and wrap up in Las Vegas on the 27th. There will be a walk-around tasting in each city. Thee has been a lot of commotion in Montalcino during 2011, as certain individuals want to change the makeup of Rosso di Montalcino by allowing grapes other than Sangiovese in the blend. Rosso di Montalcino, just like Brunello di Montalcino, by definition, must contain only Sangiovese - there are no exceptions. However, these individuals want to change the regulations allowing grapes such as Merlot or Cabernet Sauvignon to be a small part (as much as 15% under one proposal) of the blend for Rosso di Montalcino. 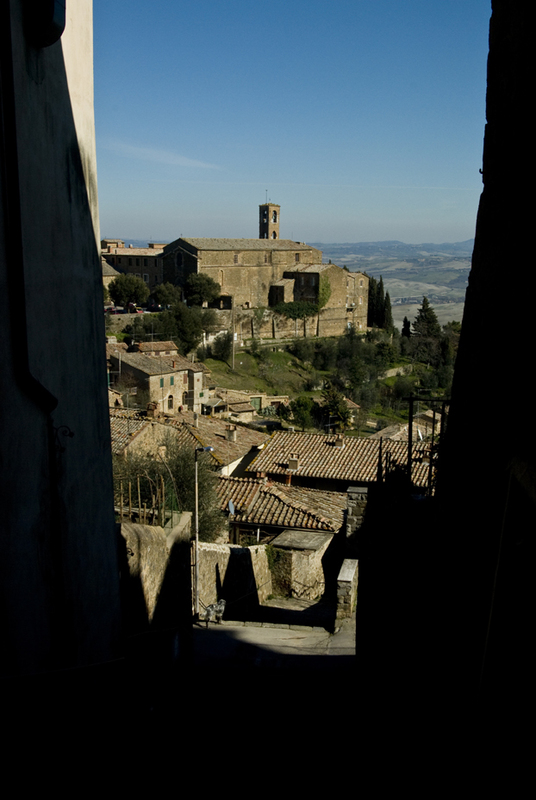 A vote was held on this matter in Montalcino on September 7 and the proposal was overwhelmingly defeated, with only 31% of the vote favoring this change. Many wine journalists and bloggers in Italy and throughout the world have commented on this, most notably Franco Ziliani in Italy at his blog vinoalvino along with Jeremy Parzen in America (here is the link to one of several posts on this subject) and Wojciech Bonkowski in Poland). Each of these gentlemen along with other noted Italian wine authorities such as Nicolas Belfrage from England, Juancho Asenjo from Spain and Kerin O'Keefe, an American wine journalist living in Italy, have all commented on the need to keep Rosso di Montalcino as 100% Sangiovese. I am in agreement with this opinion. I wanted to share a few quotes from two vintners in Montalcino about what these wines represent. I wrote an article on Montalcino in 2005 for Drinks magazine in the US; going over my notes recently, I found some interesting remarks. The first is from Rudy Burrati, winemaker at Banfi, one of the most successful estates in Montalcino. "The characteristics that we seek include the optimal tannic structure that is typical of Montalcino, freshness and fruitiness, and the "typicity" of Sangiovese grown in Montalcino, reflecting the characteristics of the weather, soil, and other elements." 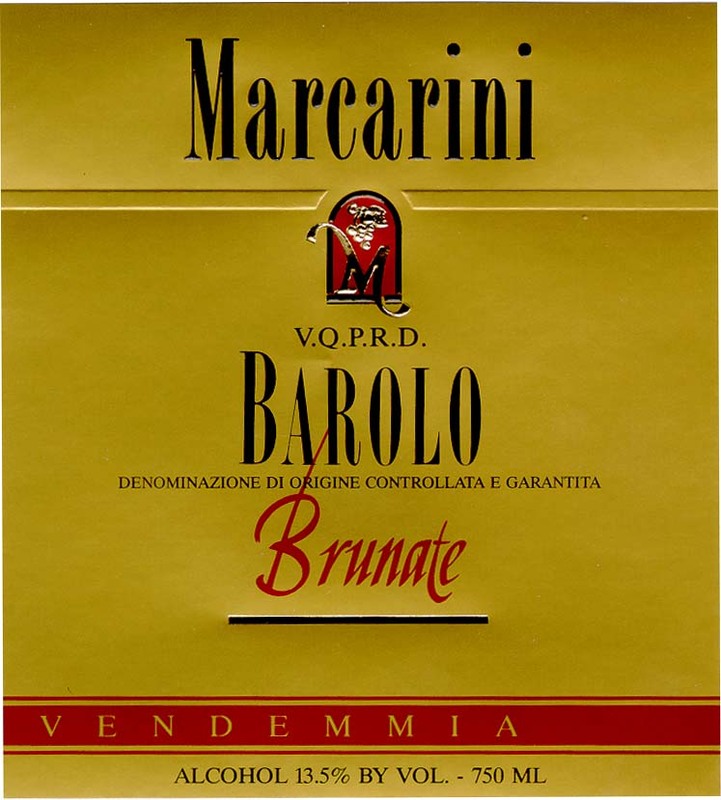 Burrati was speaking about Brunello di Montalcino here, but it is clear that he was also referring to Rosso di Montalcino as well, at least as far as freshness and fruitiness and typicity. 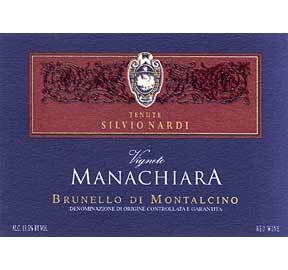 "I don't think Brunello will ever become more forward or approachable. I do however think that wine lovers are becoming more knowledgable and open to appreciate a wine as difficult as Brunello." These are his thoughts about Brunello; I did not ask him about Rosso. So here you have remarks from two important producers in Montalcino, emphasizing "typicity" as well as maintaining a style of wines that are not forward and approachable. So why the need to change things? Well with Rosso, adding a small percentage of Merlot or Cabernet Sauvignon would definitely alter the style of the wine, arguably making it more appealing to a wider audience that understands the international style of wine much easier than they do a specific approach. Consumers look to Rosso di Montalcino as a substitute for a Brunello; this is either for price ($25 for a Rosso versus $50-$70 or more for a Brunello) or for drinkability - a Rosso di Montalcino is released much earlier than a Brunello and is softer in tannins and more drinkable sooner (the current releases of Rosso di Montalcino are either 2008 or 2009, while the 2006 vintage is what is currently available for Brunello). Whatever the reason, a consumer should expect a Rosso di Montalcino to offer that thumbprint of Montalcino - which means the characteristics of only Sangiovese. If they want to buy a blended Tuscan red, they have dozens, if not hundreds of choices, some made by these same producers in Montalcino, who can bottle a Sant'Antimo Rosso DOC or else an IGT Toscana Rosso. The bottom line for me is this. There are thousands of red wines from dozens of countries around the world. Yes, the world is a smaller place and when it comes to wine, that too often means a style of wine that is easy for everyone to understand. So producers take the easy way out. Do that and you lose uniqueness, a sense of place. While the majority of producers oppose the change in regulations for Rosso di Montalcino, it is a sign of the times that this matter was even presented in the first place. It is understandable however, as it's clear that the vintners as a whole have done a poor job developing and marketing the Sant'Antimo category. They realize that few consumers know what Sant'Antimo means, but everyone understands Montalcino. So they take a shortcut and try and morph Rosso di Montalcino into something it's not. Montalcino - Rosso or Brunello - must continue to have an historical identity. That means only a single variety - Sangiovese. On Thursday, I received an email from Richard Elia, publisher of Quarterly Review of Wines, informing me that he was retiring and that the current Autumn issue would be the final one after 35 years of publication. I have been writing for the past thirteen years for QRW; in this post, I would like to let my readers know how much I've enjoyed working for Richard during this time frame. He gave me my first assignment back in 1998, which I'll always remember, as I was an unknown entity at the time. I had only been writing wine articles for little over a year (I began life as a freelancer with the Chicago Tribune the year before) and had not yet written an article for a national publication. My piece on Cuvaison winery in Napa Valley for QRW was my first in this vein and I took great pride in this work. Richard commented on the closing paragraph, which he thought was a bit over the top; I admit to being a bit defensive at the time and argued with him. Of course, he was right and after my initial reply, I realized I had some things to learn about writing and dealing with editors. His comment on that first piece was one of the few he ever sent along; I can only recall two other articles I wrote for the magazine in which Richard said anything. One time he told me that he cut one paragraph as it was repetitive and in the other instance, he told me that he wanted me to make certain that I took my time writing articles. That was it - three comments (all helpful) from a total of more than 30 articles. I certainly can't complain about that, especially given a few editors I wrote for that nitpicked my work (and the work of others). Most of my articles in fact, were published exactly as I wrote them. Not a paragraph was moved around, nor a sentence changed or even a word deleted. What more could a writer ask for? Richard clearly respected my work and in one email he even told me, "We only hire excellent writers," explaining why most articles were published without any major changes. He was telling me how much he enjoyed my writing - how nice was that and what a boost to my ego and career! It was always an easy process getting an assignment at QRW. I would send along an email with two or three suggestions and he would reply (always in a prompt fashion, mind you) that Randy Sheahan, the editor, liked my idea for a piece on a particular subject. All I had to do was write it and have it in by the deadline, that was it. There were no suggestions from Richard about covering any particular subjects in my piece - he gave me the freedom to write what I wanted. Another great thing about Richard was the way he paid his writers. Most publications pay upon publication, which can mean anywhere from two to four weeks after the issue is released. But Richard paid before the issue was published. I knew that if I had an article in the Spring issue, which would be released in March, I could expect a check slightly after February 1. And sure enough, I'd receive it on the 3rd or 4th. As a freelance writer, I loved that - who wouldn't? Those are a few thoughts about our business relationship. I also need to emphasize the quality of QRW. In an era where sound bites - that is, scores - were what most people remembered about any number of wine magazines, QRW never used a point scale for wines. Most articles in the magazine featured tasting notes and once in a while, a writer might use a star rating or classify a wine as "very good", "excellent" or "outstanding", but that was it. No need to worry if a wine received 92 or 93 points (what exactly is the difference between those two scores anyway?) - you read the magazine for the articles, and in the process, learned about the great - and sometimes everyday - wines of the world and the people who made them in the old fashioned way. This was a magazine about feature articles and if you truly loved wine, you had to respect that. "Ratings have killed wine education: consumers give themselves over to rating not reading... What numbers can't do that words can do is excite the imagination. But consumers believe this less and less and worship more and more." Strong words, words that I am in total agreement with - I couldn't have said it better myself. "Why do it? Who beside the very wealthy can afford them? What have we done to deserve the current prices of Bordeaux?" Clearly Bordeaux lovers will take exception to this, but Richard wrote what he - and a lot of wine drinkers- believe. You have to respect him for that. It's a sad day for myself, as I'll no longer write for QRW, but life will go on for me, as I have a few other publications I'll continue to write for (although how long that will last is anybody's guess). An unfortunate sign of the times is the decline in interest in wine magazines - and many other industry publications as well. I hope that changes soon. But it's truly a sad day for wine lovers everywhere as a classy magazine is going out of business after 35 years. I'm sure my fellow writers at Quarterly Review of Wines share my feelings. There weren't many other wine publications out there that covered wine with as much insight - as well as common sense - as this one. Richard, thank you for your support over the past thirteen years. You made me a better writer and for that I'll always be grateful. "I detest mundane toasts... I shall remember to toast myself, if for no other reason than having survived wine publishing for 35 years." Forget ranking the great wines of the world for just a moment. Instead focus on the wines you love the most - the ones that are delicious, the ones that you'd love to try again and again. I tend to think the latter category of wines are the ones I am more interested in on a daily basis. Sure, it's a memorable occasion to try a great Barolo or Burgundy, but those moments don't take place too often. Rather, comfort wines are the ones we generally enjoy. Well I just found one of my all time favorite wines that is delicious, fun and not very expensive - a great combination in my mind. It's a 2011 Moscato from Innocent Bystander in Victoria, Australia and boy, is this a neat wine! I love Moscato - or Muscat, if you will, from just about anywhere. The grape has some of the most easily recognizable aromas and they're usually intensely fruity and floral, ranging from peach to apricot to acacia flowers. While there are a few versions made dry (most notably in Alsace), many versions are slightly or moderately sweet. Australia is home to many superb Muscats - known as "stickies" - that are sweet and quite lush. Many of these have an amber or tawny color as they have been aged in wood; along with the sweetness, there is often a light nuttiness. Then of course, you have the lovely Moscato d'Asti from Piedmont in northern Italy, which is slowly becoming one of the world's most beloved wines. Made in a frizzante (slightly sparkling) style, the wines burst forth with amazing aromas of ginger, peach, apricot and orange zest and have a delicate sweetness to them. Best of all, they're light as a feather as they are only 5.5% alcohol, meaning you can drink a full bottle without too much trouble. I was asked by a representative of this winery if I wanted to try this wine. I replied yes, as I love Moscato. I thought I'd find a wine I liked, but I wasn't prepared for this wine, which I absolutely love! In fact, I can honestly say that this is one of the most pleasant surprises I've discovered from any wine region anywhere in the world over the past five years! 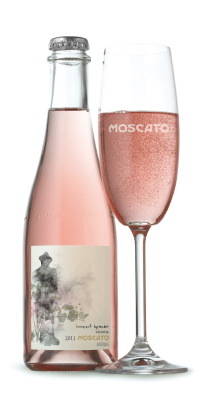 Try it and I'm sure you'll fall in love with it as well - especially at the $14 retail price (750 ml bottle). After a hot July and August, I've returned to trying wines again. A number of reasonably priced Chilean wines have come across my desk lately and I've been especially impressed with two - one white and one red. 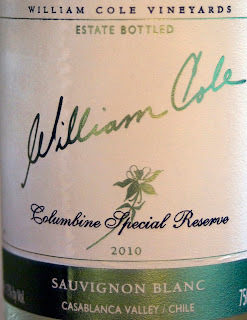 The white is the 2010 William Cole Sauvignon Blanc "Columbine Special Reserve" from Casablanca Valley. This wine region has become one of the leading in Chile for production of cool climate varieties, especially Pinot Noir and Chardonnay. But other varieties, such as Syrah, Riesling and Sauvignon Blanc are also playing an important role here as well. 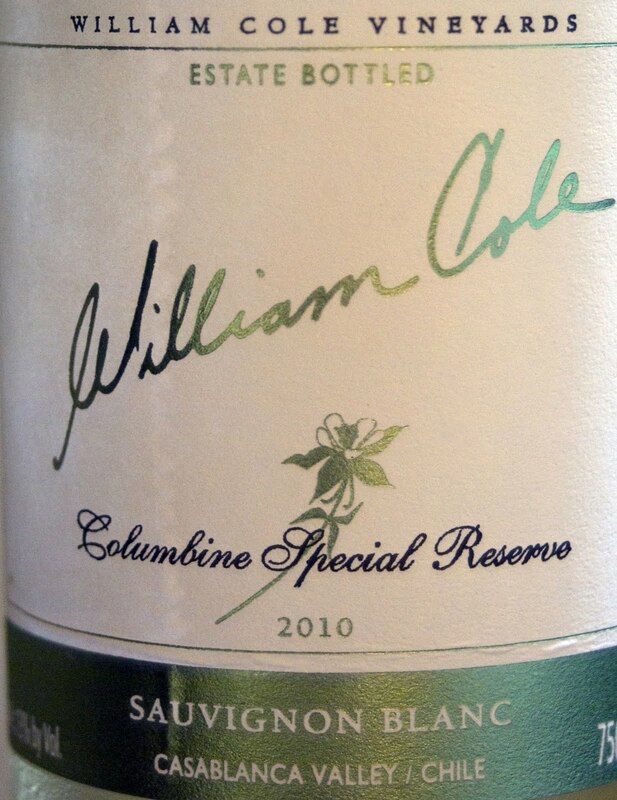 I've always liked William Cole's wines and have especially loved his price points, which are generally in the mid-teens. I can't say that I've always been wild about the wines, as some of them are pleasant, if a bit straightforward. But with this Sauvignon Blanc, Cole has really delivered a lot of character for not a lot of money. The wine has beautiful varietal aromas of freshly cut hay, so you immediately know it's a Sauvignon Blanc that plays it straight ahead; this is not a Sauvignon Blanc pretending to be a Chardonnay. Medium-full and aged only in stainless steel, so as to highlight the grape's fruit character, the wine has tangy acidity and notes of fresh lime in the finish. I've enjoyed it with everything from pork fried rice to sautéed shrimp and think how perfect this would be with a fish preparation with lime sauce, such as ceviché! Best yet, the US retail price is $15 and believe me, there's an awful lot of character for the money. This is a cool climate Sauvignon Blanc that many producers in Chile make so well- the acidity keeps the wine fresh and overall the wine has a delicate feel on the palate, while still displaying nice texture. Well done, Mr. Cole! The second wine is the 2010 Meli Carignan from Maule Valley. Maule is located further south in Chile and there are plenty of old vines here planted to Cabernet Sauvignon, Merlot and Carmenere, although white varieties such as Chardonnay and Sauvignon Blanc are also an integral part of this landscape. Meli produces a Carignan, a grape most commonly associated with Southern France. What's distinctive about this wine are not only the moderate tannins (especially compared to Cabernet Sauvignon), but also its currant and red plum flavors - this is not a big, super ripe jammy red that is too often produced around the world these days. Rather, this is a subdued red, medium full with a light peppery note in the finish and good acidity, meaning the wine has a freshness and edge that makes it a wonderful food wine. Pepper steak would be a perfect match, as would lighter game birds or even something as simple as a chicken or pork taco or empanada. The price on this wine is also $15.